You guys know that whenever you need to comment on my blog (hosted by Blog-City), you need to answer a simple arithmetic question as a way to counter comments generated by spam bots. That goes for myself when I reply to your comments by adding a comment myself. So imagine my surprise when I keyed in "12" as the answer to the question of "4 + 8" and I got an error message saying that my sums were wrong. Zhun bor? It took me a while before I figured out what went wrong. The comments page was left there for too long (I loaded the page and before I could comment, I was called away to do something else) that the time-out clock behind the comments page expired and has since changed the arithmetic question. However, due to the fact that I did not refresh the page, the new arithmetic question was not updated lor. Solution: Just click refresh and the page will show you the current arithmetic anti-spam question. However, do copy out all your text in the comments box before refreshing for there is the odd chance that whatever you typed may be wiped out when you refresh the page. So after copying, refresh, then paste if required. Afternote (18 Aug 2010): Blog-city is going to close shop at the end of 2011 and so I am migrating everything back here. 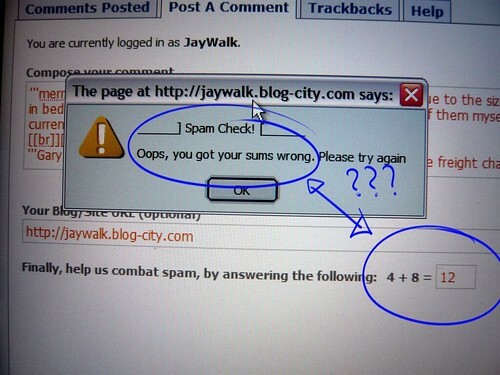 As such, the arithmetic anti-spam challenge is not longer relevant. wah lao, of all comments, my comments kana..
Gary: Fret not. I get that a lot myself.